Welcome to my website Belle Époque Creations where you will find European inspired creations for you and your home. My website features the items that I sell on my Etsy.com shop, BelleEqoqueCreations. In my shop I combine my creativity with my love for fabric, antique haberdashery and my love of Europe. Some of my handbags, totes, purses and bracelets have been designed with buttons, lace and ribbon I have collected. I also offer home goods like aprons, pillows and home decor. I love to travel and collect items to design with. Please contact me if you have any questions. Cheers!! This cute handbag is made from home decor fabric in shades of purple, cream and brown. The pattern to the fabric is very interesting and colorful. This handbag was designed in two different but coordinating fabrics. The brown bag has a coordinating purple print fabric. I have embellished the purse with linen trim and a lovely button that reflects the purple shades. This bag is fully lined and has a double pocket. The bag has a gusset bottom. The double handle straps can be worn as a shoulder bag. Spot clean only. Measurements: 10 inches wide at the top of the handbag and 10.5 inches tall. The double handles each measure 26 inches end to end. 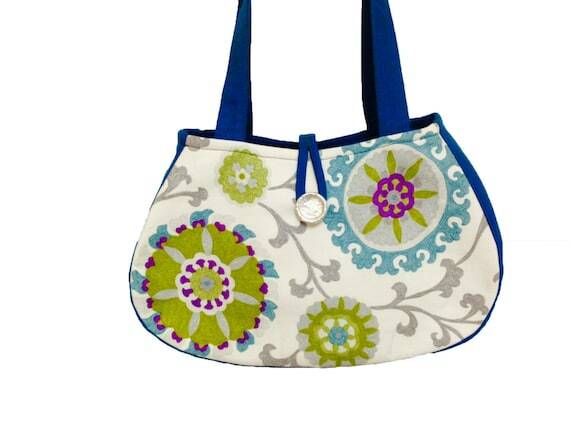 This beautiful modern design fabric shoulder bag is perfect for year round style! You are always in fashion with a nature print in these beautiful colors. 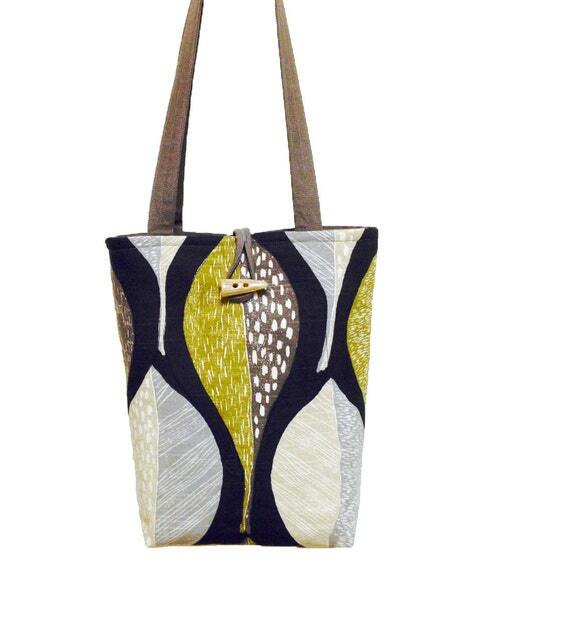 I have designed this great tote around the leaf print fabric. I love the colors in this fabric. The fabric is a quality home decor fabric. I have machine quilted around the leaf pattern for form and structure. The bag is fully lined with a coordinating grey fabric. There is a large double pocket inside the bag. The closure on the tote is a loop and toggle button closure. The bottom of the bag has a gusset for more room inside the bag. The straps on this tote are long enough you can carry the bag as a shoulder bag if you wish. Spot clean only please. Measurements: Approximately 13 inches tall by 11.5 inches across the top of the tote bag. The double handles each measure 28 inches end to end. This beautiful black handbag is très chic sporting it’s lace and French Ribbon! Black and white is always in style. 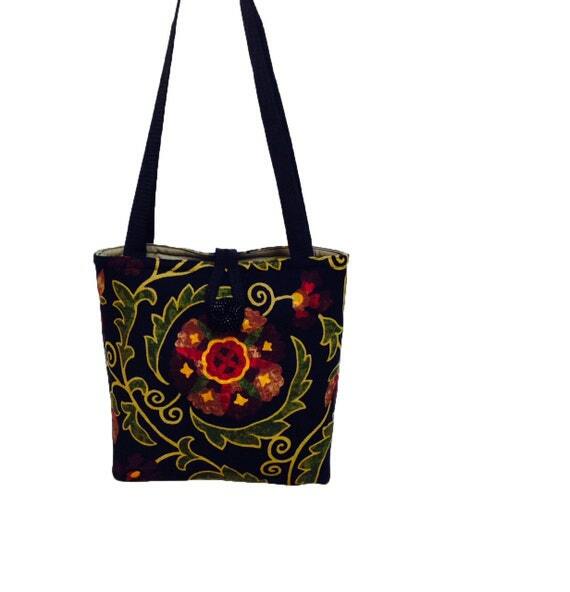 I have created this handbag from beautiful and sturdy home decor fabric. The bag is fully lined in a festive black and white print and has a large double pocket. This bag has a gusset bottom for extra room. I have embellished the front of the purse with lace and French black and white check ribbon. There is a vintage black button from England on the front of the bag for extra interest. The handles on this bag are long enough you can carry the bag as a shoulder bag if you wish. Measurements: 11 inches tall by 11.5 inches wide at top of handbag. Double straps each measure 26 inches end to end. The colors in this bag are simply royal! I have constructed this beautiful shoulder bag from two different fabrics. The floral fabric is a stain resistant fabric and the colors are vibrant. This bag is fully lined in a complementary blue fabric and has a large double pocket. The closure on this bag is a loop and button closure. I love the silver metal button with the bright colors of the fabric. The double handles are long enough you can carry the bag as a shoulder tote or shoulder bag. Spot clean only please. Measurements: Approximately 14 inches across at widest point, 4 inches deep, 14.5 inches tall. The double straps each measure 28 inches end to end. This black floral handbag is a beauty. The colors in the printed fabric just shine out. This shoulder bag will carry you through any season. 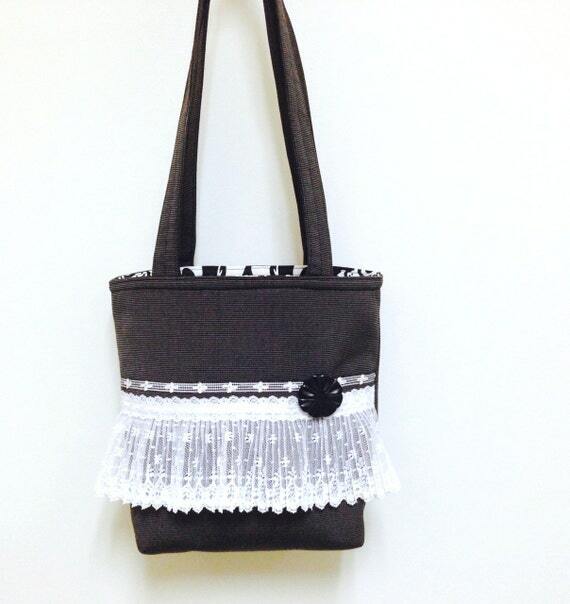 I have designed this lovely black shoulder bag from sturdy and beautiful linen blend home decor fabric. The handbag is fully lined in a khaki colored cotton fabric and has a large double pocket. The bottom of the bag has a gusset adding extra room in the handbag. The closure on the handbag is a tab and button closure. This handbag comes with its own matching zipper pouch. Ooh La La this is a beautiful black bag with red fringe! This purse is for your “spicy” days or nights. The red fringe is sure to conger up thoughts of the red windmill and the dancers inside. I have attached your very own windmill charm. The bag is totally lined in a silver tissue Lame fabric. There is a handmade red flower with rhinestone button center. The closure on the bag is a very special Paris antique button. The button is marked Paris on back and dated 1882! Watch out for Toulouse-Lautrec and his muse, dancer Jane Avril. Who knows you might end up in one of his drawings! Spot clean only. If you can’t make it to the Moulin Rouge then take it on an evening out dancing your own cancan. Kick up your heels and have fun with this bag. Measurements: Approximately 11 inches high by 9 inches wide. Single strap measures 42 inches end to end.